Another of the patents from my day job at Citrix Systems just issued. “Systems and methods of using the refresh button to determine freshness policy,” U.S Patent #8701010. This was from my Web Optimization Period. It was filed in 2007 and only now made it into the light of day. 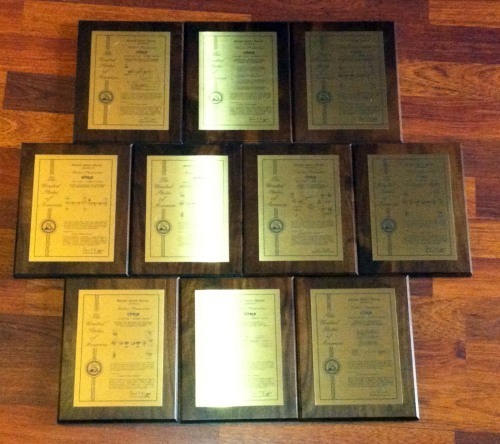 My employer, Citrix Systems, sent me the plaques for the patents that I helped develop for them. Woo-hoo! Ten patents about different kinds of network acceleration, which is what my day job is about. The reported contacted me because of a blog posting I made giving my experiences with Verizon’s range extender (which I’m still quite happy with).